When it comes to an investment in your comfort, you have high expectations. Outstanding energy efficiency, dependable performance, lasting durability, low sound levels, proper filtration, dehumidification capability, and quick completion of your project probably top your wish list. Allied Aire, Inc. delivers all that and more. We value customer satisfaction and go above and beyond standard procedures to ensure a more rewarding experience. Years of project management and an unwavering commitment to quality ensures that every step of the process is handled professionally, accurately, and to your exact requirements. We are so confident in our work ethic that we stand behind our installation service with a 100% Customer Satisfaction Guarantee. Our higher standard of customer service, business practices, and technical know-how has earned us recognition as a Carrier Factory Authorized Dealer. Our team continues to receive factory training and updates specific to increasingly complex technology, allowing us to better match your needs to the perfect solution. To stay wonderfully cool in the Charlotte Metro Region, call Allied Aire, Inc. at 724-473-3336 and experience a whole new level of comfort. The best systems for your next Air Conditioner installation! Established in 2003, we’ve had plenty of opportunity to install, service, and form opinions of various cooling systems. We recommend and specialize in Carrier brand products because they are the most efficient, dependable, and consistent HVAC systems on the market. No one can compete with the innovative technology that brings you up to 21 SEER, sound as low as 65 dB, and Greenspeed Intelligence. ENERGY STAR qualified in all sizes, as well as a Consumer’s Digest Best Buy winner, the Infinity series features two-stage compression, allowing advanced humidity control, and longer run times at lower speeds. The Infinity control never overlooks the connection between its operation and cooling costs, and actively works to keep energy usage at a minimum. 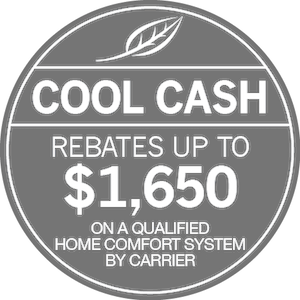 Enjoy superior comfort with a modern air conditioning system! To take advantage of even greater energy savings, unprecedented access, and tighter management of your HVAC system, consider the Infinity Series Touch Controls. From a single user-friendly thermostat, you can customize temperatures, humidity, ventilation, airflow, and indoor air quality for up to eight different zones. If your system includes a heat pump and furnace, you can also oversee the performance of your Hybrid Heat system. And with WiFi enabled remote access, you can make adjustments and stay informed from your smartphone, tablet, or computer. Filter replacement reminders, system diagnostics, energy-use tracking, local weather 5-day forecast, auto changeover between heating and cooling, and easy programming for energy conservation when you’re away from home, provide convenience, cost-savings, and comfort options that make your life easier and more enjoyable. While there are a great many options and choices to make, the experts from Allied Aire, Inc. are happy to provide information, recommendations, and help you determine the right fit for your budget and expectations. We make your project simple, easy, and rewarding. By taking care of all of the important details and sticking to your exact specifications, Allied Aire, Inc. delivers satisfaction. We leave nothing to chance or guesswork, and draw from years of industry training and experience to properly size, design, and implement your new system. Our technicians are NATE-certified and ACCA qualified, and share a commitment to conscientious and quality service. Whether you’re considering the new installation or upgrade of a central air conditioning system, heat pump, mini-split, or thermostat, know that Allied Aire, Inc. serves your best interests. Homeowners across Cornelius, NC, Huntersville, NC, Davidson, NC, Mooresville, NC, Denver, NC, Charlotte, NC, Concord, NC, Harrisburg, NC, Mt. Holly, NC, Kannapolis, NC trust their comfort to Allied Aire, Inc. because we never disappoint!